Gem size three-quarter portrait tintype of a nice looking gentleman with a light-colored bowler (derby) and the sack suit buttoned at the collar to let the waistcoat (vest) peek through. It’s a bit dark on the scan so I lightened it up a bit for the blog. It does look fine when you look at it with your own eyes. Gem tintypes were the cheapest to produce due to their tiny size, and naturally very popular from the 1860s to around1890. This one is between a 1/9th plate and the typical gem which is usually 1.5″ x 1.5″. 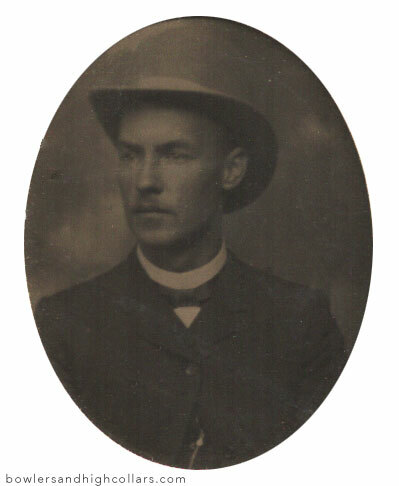 This entry was posted on Saturday, March 21st, 2015 at 10:40 pm	and tagged with 1/9th plate, 1870s-1880s, bowler, portrait, tintype, victorian and posted in Gentlemen, Tintypes. You can follow any responses to this entry through the RSS 2.0 feed.